So said Rick Schosberg following Giant Moon’s win in the Grade III Excelsior on April 4th at Aqueduct. 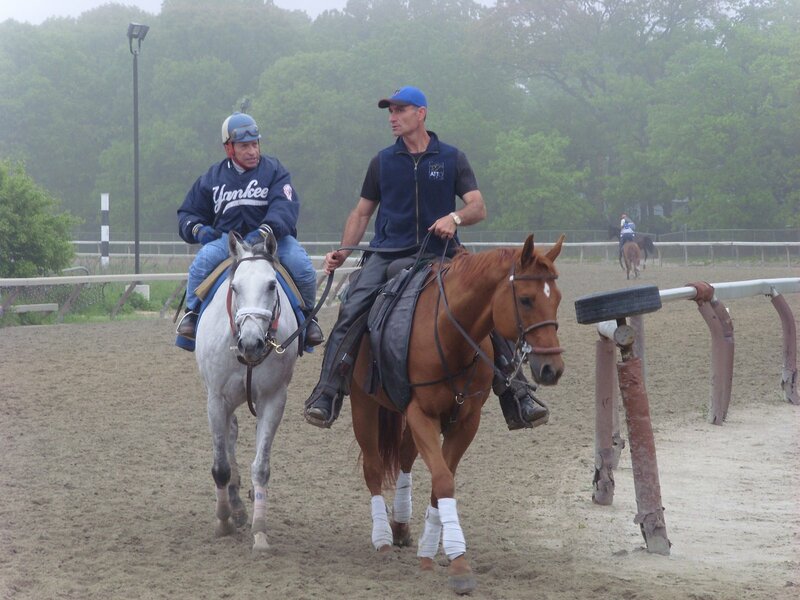 Sports other than racing, particularly hockey, don’t ever seem to be far from the trainer’s mind; when I show up at his barn on a May morning, he’s wearing a Mets’ hat, and he bemoans the Yankees’ jackets adorning two of his exercise riders. A graduate of Cornell University, Schosberg played football in college; though his hockey skills didn’t quite get him on to Cornell’s Division I team, he has taken to the ice in various other leagues, and we talk about the Stanley Cup playoffs and our rooting interests now that our team is out of it. He commends the talent of the Carolina Hurricanes, lauding their team and their goalie. They, too, will soon be on the golf course instead of at the rink. Schosberg tells stories of paddock and gate antics, some of which end with Light Tactic flipping out literally and figuratively; as is the case with her hockey-playing counterpart, this bad behavior seems to have little effect on her game, as she can act up in the paddock, completely lose her composure, and go out and win. In mid-May, she had a record of three wins, a second, and a third from seven starts; last Sunday, she made her first start since last fall in a state-bred stakes race at Finger Lakes, finishing fourth after ducking in at the start. 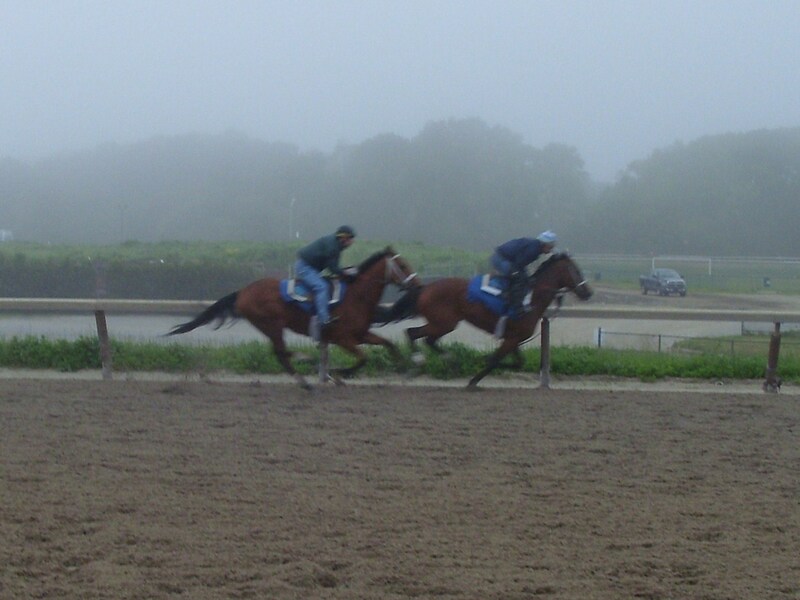 Spunky and Princess Maura, both three-year-old fillies, go out to train in company. Princess Maura began her career earlier this year rather inauspiciously, with four straight finishes at Aqueduct out of the money. 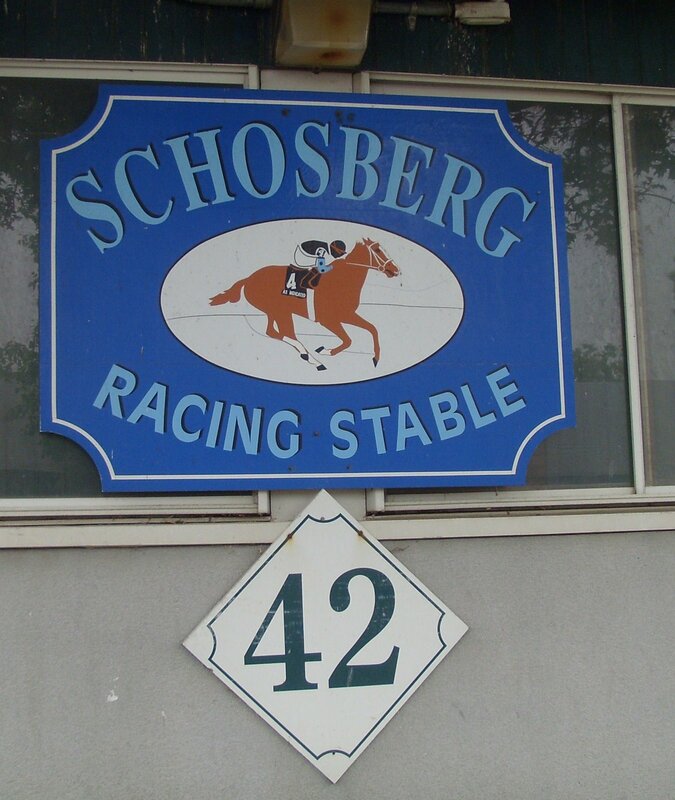 In late April, Schosberg switched her to the turf and she responded with a three-length win at odds of 20–1. Her affinity for grass that day was no fluke, as she followed up that win with another victory on the Belmont turf in early May, this time at 12–1. Good luck on getting those odds again any time soon. Spunky made nine starts as a two-year-old, all at Woodbine, with four wins and two seconds. She then became a hot commodity on the New York claiming circuit; Dom Galluscio claimed her from John Morrison; she made one start with Galluscio before Bruce Levine claimed her, and after one race with him, Schosberg took her. She likes dirt as much as she likes the artificial stuff, with two wins, a second, and a third this year. Though I don’t see him train this morning, I ask about Thatsrightofficer, who came within a head of beating Big Apple Triple Crown winner Tin Cup Chalice in the third leg of that series, the Albany Stakes, last August at Saratoga. That race began a string of seconditis for the Officer colt, who’s been second in four of his last six starts, including the Empire Classic last fall at Belmont. 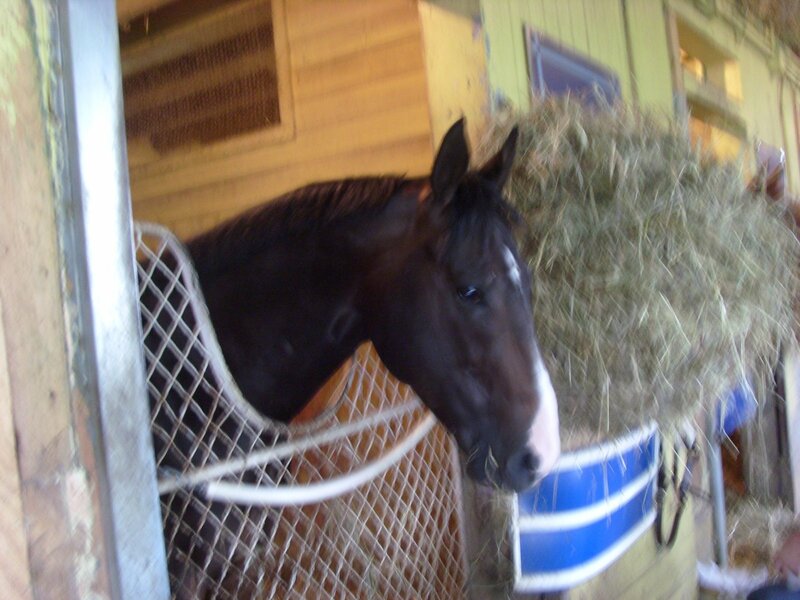 An injury sent him to spend the winter in Ocala, and he returned to the races with a respectable third on May 23rd. We walk back and forth several times between his barn and the track; Schosberg, on the pony, jokes with exercise riders, calls out to other trainers, and tells me stories about his horses. He stops suddenly: “Grab that big rock, will you?” I look down at the horsepath. Big rock? I don’t see any big rock, and I feel stupid. Big rock? “That one—there…” he gestures. “By your left foot—keep looking, keep looking.” I am looking for something of boulder-like proportions; what he sees is a smooth stone, about an inch or so in diameter. Ah, I get it—a big rock for the horses, not for the humans. I walked over it without noticing it; Schosberg, from the pony, spied it immediately. “Throw it to the side, will you? Last thing we need is a horse stepping on that and getting hurt.” I dutifully comply. A half-brother to Giant Moon, Samurai Moon, is making his first start later in the day. This son of Fusaichi Pegasus is apparently well-named, as he, too, is a handful in the barn, and Schosberg speaks despairingly of the colt’s ebullience, particularly around the fillies. I see them later in the paddock—the trainer’s got the colt back behind the paddock; even away from the other horses, Samurai Moon is studdish and hard to control. After he’s saddled and Ramon Dominguez is aboard, the colt decides it’s time to run, and he’s galloping around the paddock. The paddock is cleared of the other horses—“No pony! No pony!” calls Schosberg—while Dominguez gets him in hand and steered safely to the track. Samurai Moon acts up on the track and behind the gate; given the antics, he might be forgiven for finishing fourth, and he still seems to have energy at the end of the race, though he’s well-beaten. Ah, adolescence. He pauses, then brightens. “It’s Ladies’ Day!” His answer is definitive, and, of course, he turns out to be right. His NTRA biography tells us that he’s “committed to racing in New York year-round,” but on this Preakness morning, one remembers that a year ago, he was in Baltimore, saddling Giant Moon in what would turn out to be his last start for nearly ten months. The colt developed some serious foot problems that Schosberg discussed following the win in the Excelsior; in four starts this year, he’s got two wins and a second, plus that dismal performance on the turf. The plan after his win in the Excelsior in early April had been to run Giant Moon in the Brooklyn on June 5th, but his foray onto soft turf has left him behind schedule, so the road to the Whitney may lie in the July 4th Suburban. “He hates the mud,” says Schosberg. “We saw that in the  Gotham,” in which he finished last in a field of nine. His trip over the turf left him sore and with his muscles “out of whack.” “Edgar [Prado] knew within an eighth of a mile that he didn’t like it, so he took care of him,” easing him. No stranger to the Big Horse, Schosberg conditioned 1995 juvenile champion Maria’s Mon to graded stakes wins in the Sanford, the Futurity, and the Champagne, and he brought Attila’s Storm to three consecutive Breeders’ Cups. With an eye on the Grade I Whitney at Saratoga later this summer, Schosberg has been in this business long enough to know that trainers plan, and the racing gods laugh. 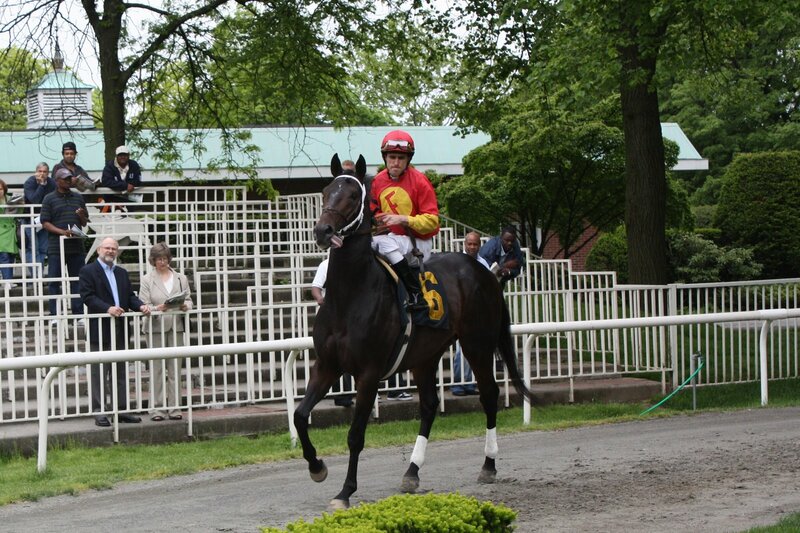 Thanks to Keith McCalmont of Triple Dead Heat for the paddock photos of Samurai Moon. Past performance information courtesy of TrackMaster.